The Rigid Industries SR-Series (single row) Light Bar, like our flagship E-Series, leads the industry in low profile performance LED lighting. Available in a wide range of lengths and configurations, the SR-Series light bar is the perfect low-profile option for everything from on and off-road racing to police and fire rescue vehicles to marine applications. The SR-Series light bar is designed to project light at extreme distances while consuming very little power. Its durable extruded aluminum housing and virtually unbreakable polycarbonate lens are sealed against the elements for years of trouble-free operation. The Marine Series products are given special attention due to the elements they will be exposed to in a marine environment. The aluminum housing receives a chromate conversion coating that acts as a corrosion inhibitor against elements such as salt. We then give the housing a high quality, UV-resistant powder coat finish. We use 316 marine-grade stainless steel hardware that receives a coating that's been tested for over 1,000 hrs of corrosion resistance. The mounting bracketry included with our marine products is also 316 stainless steel. This product does not include a wire harness or switch, due to the fact that most installations on marine equipment are custom and require smaller holes and unique components. Our patented Specter optics system features 50% more LED's than our Hybrid optics in the same footprint and is specifically designed to cover more area. By incorporating a reflector with no facets or orange peel, the Specter optics system produces an intense, smooth beam with minimal wasted light. Our engineering team designed the Driving version of our Specter optics system to project light not only far, but also wide. This light utilizes a narrow, oval-shaped reflector that projects both spot and flood beam patterns. Rather than a conical beam, this technology creates an oblong beam that maintains a bright center hot spot, as well as incredible horizontal dispersion. Our circuitry is designed in-house to be more powerful, be more efficient, and generate less heat. Our durable aluminum housings feature custom, over-sized heat sinks which keep the temperature down and allow our LED's to run cooler and brighter. All Rigid Industries LED lights receive a high quality powder coat finish, a custom-molded rubber seal, and an unbreakable, scratch resistant lens. Rigid Industries LED lights are engineered to withstand whatever you, the road, or nature can throw at them. Kit Includes: Plug and Play Harness with Switch as well as Mounting bracket and hardware. 50,000+ Hr LED Lifespan. Instant On / Off - No Warm Up. Over / Under Voltage Protection. Designed, Engineered, & Assembled in the USA. Peak Beam Intensity: 29,000 cd. Here at Midwest Aftermarket customer service is our highest priority! 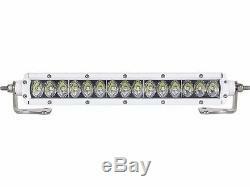 The item "Rigid Industries Marine LED SR2 Series Specter Driving Light 10 Light Bar" is in sale since Tuesday, May 26, 2015. This item is in the category "eBay Motors\Parts & Accessories\Car & Truck Parts\Lighting & Lamps\Fog/Driving Lights". The seller is "midwestaftermarket2013" and is located in United States. This item can be shipped to United States, Canada, United Kingdom, Denmark, Romania, Slovakia, Bulgaria, Czech republic, Finland, Hungary, Latvia, Lithuania, Malta, Estonia, Australia, Greece, Portugal, Cyprus, Slovenia, Japan, China, Sweden, South Korea, Indonesia, Taiwan, South africa, Thailand, Belgium, France, Hong Kong, Ireland, Netherlands, Poland, Spain, Italy, Germany, Austria, Russian federation, Israel, Mexico, New Zealand, Philippines, Singapore, Switzerland, Norway, Saudi arabia, Ukraine, United arab emirates, Qatar, Kuwait, Bahrain, Croatia, Malaysia, Brazil, Chile, Colombia, Costa rica, Panama, Trinidad and tobago, Guatemala, Honduras, Jamaica.